Malachi 4:4 tells us in the last days the people of YHVH will obey even the statutes and ordinances. 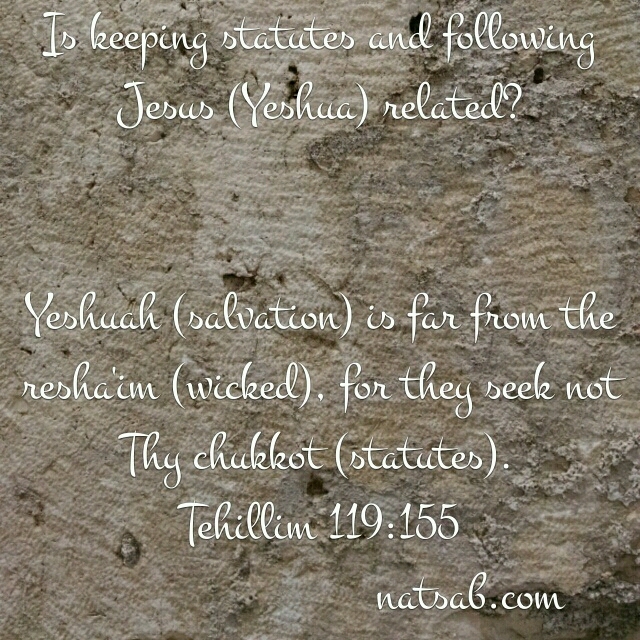 Here, Psalm 119 confirms the connection between salvation (Yeshua) and statutes…. Are you keeping statutes or traditions? This entry was posted in Visual Scripture and tagged Day of the Lord, Messianic, Psalm 119, statutes, Yeshua. Bookmark the permalink. This is a psalm which continues to divulge its depth! In our western mode of action, we try to get things done in a hurry and move on. So often that is our approach to the Word, isn’t it? But I like to think of David spending the hours of shepherding mulling over the marvellous depth of God’s Word. Hours … yes, hours of no interruptions, no appointments needing filling, no children vying for our attention … just watching the sheep and goats eat their way across the landscape while he spent his time just revelling in the wonder of how the statutes, the precepts, the testimony, the instruction of the Father relate to such a pastoral lifestyle – or one lived in the centre of modern urban, crowded, demanding, tempting, cityscapes. Maybe a day per verse of Psalm 119 would help us uncover some of what lies hidden there for the diligent searcher.